They have been recording and touring together for more than 25 years and have thrilled audiences across Europe, North America, Asia and Australasia with their dynamic show in over a decade of international touring. They have played the biggest festivals in the world and the tightest clubs on the planet and brought the dance-floor to volcanic like eruptions everywhere they go! They’ve toured Australia twice – 2013 and 2014 – thrilling club goers as well as knocking out larger crowds at the Sydney Festival, WOMADelaide and Meredith Festival. 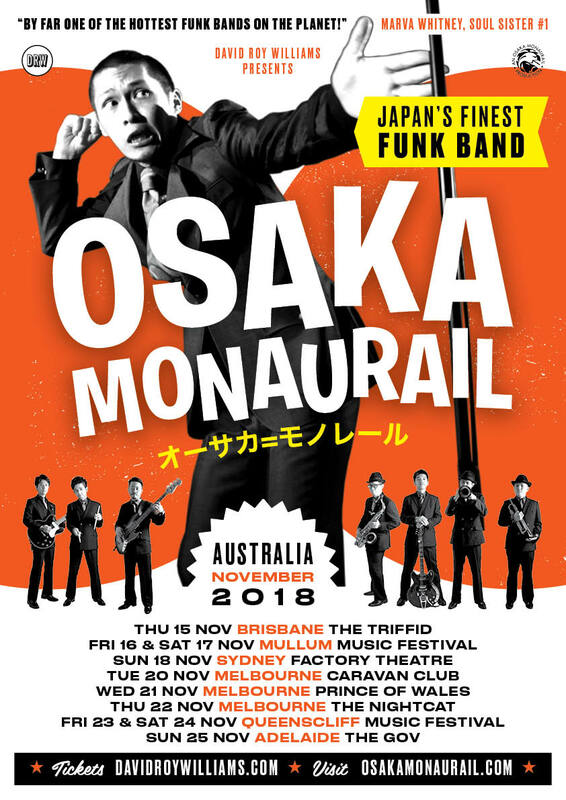 Formed out of Osaka University’s jazz society in 1992, Osaka Monaurail took James Brown’s funk template as ‘the gold standard’ for a rhythm combo and named themselves after the 1975 Funk classic “J.B.’s Monaurail”. They appropriated even the miss-spelling and set out to be the ‘new ministers of super heavy funk’ for future generations. Now, having toured with funk icons and James Brown associates Marva Whitney, Fred Wesley and Martha High, as well as producing and backing solo albums for Whitney and High, they are on a mission to capture the energy, sound and excitement of funk’s heyday and beyond, a sound that is as free as it is organised and disciplined. Expect to see a high energy eight-piece band with sharp suits, organised steps, trumpets twirling in formation and the dynamic showmanship of charismatic singer and director Ryo Nakata. And expect to hear world-class, authentic, heavy funk.